For the first time since the King James Version in 1611, Willis Barnstone has given us an amazing literary and historical version of the New Testament. Barnstone preserves the original song of the Bible, rendering a large part in poetry and the epic Revelation in incantatory blank verse. This monumental translation is the first to restore the original Greek, Aramaic, and Hebrew names (Markos for Mark, Yeshua for Jesus), thereby revealing the Greco-Jewish identity of biblical people and places. Citing historical and biblical scholarship, he changes the sequence of texts and adds three seminal Gnostic gospels. Each book has elegant introductions and is thoroughly annotated. 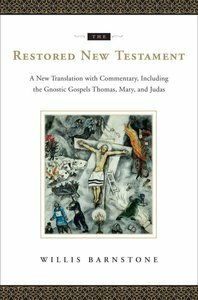 With its superlative writing and lyrical wisdom, The Restored New Testament is a magnicent biblical translation for our age. - Publisher From acclaimed scholar Willis Barnstone, The Restored New Testament -- newly translated from the Greek and informed by Semitic sources.In his monumental new translation and restructuring of the New Testament, Willis Barnstone, the distinguished literary translator, prize-winning poet, and biblical scholar, has sought to rediscover the character of the Bible, the most read and influential book in the world. His translation is both fresh and faithful, seeking to bring back the plain, lyrical, narrative speech of the original Greek. Barnstone also has restored the original Greek, Aramaic, and Hebrew forms of names (Markos for Mark, Yeshua for Jesus, Yaakov for James, Galil for Galilee), thereby revealing the Greco-Jewish identity of key biblical figures and their geography. He treats the text as a work of literature, and invokes historical and biblical scholarship to revise the canonical selection and traditional sequence of texts.Heavily annotated and including a general study and thorough introductions to each book, The Restored New Testament gives a pioneering and powerful literary version of scripture. About "The Restored New Testament"
From acclaimed scholar Willis Barnstone, The Restored New Testament -- newly translated from the Greek and informed by Semitic sources.In his monumental new translation and restructuring of the New Testament, Willis Barnstone, the distinguished literary translator, prize-winning poet, and biblical scholar, has sought to rediscover the character of the Bible, the most read and influential book in the world. His translation is both fresh and faithful, seeking to bring back the plain, lyrical, narrative speech of the original Greek. Barnstone also has restored the original Greek, Aramaic, and Hebrew forms of names (Markos for Mark, Yeshua for Jesus, Yaakov for James, Galil for Galilee), thereby revealing the Greco-Jewish identity of key biblical figures and their geography. He treats the text as a work of literature, and invokes historical and biblical scholarship to revise the canonical selection and traditional sequence of texts.Heavily annotated and including a general study and thorough introductions to each book, The Restored New Testament gives a pioneering and powerful literary version of scripture. Willis Barnstone is a poet, translator, and religious scholar. Author of "The Gnostic Bible", "Caf de l Aube Paris" (French), and "The Restored New Testament", he is a distinguished professor emeritus of comparative literature and biblical studies at Indiana University.